The SE error code in Samsung washers occurs quite often. Often it happens if a user doesn’t provide proper care of the appliance. The SE error code indicates that the failure occurs during water draining. Why does the SE error code appear? The SE error usually appears on Samsung washing machines display when the program has already finished washing and the washer should start laundry rinse cycle. At this point, according to the program, the machine should drain the dirty soapy water, after washing the laundry. Then, the appliance pours clean water for rinsing. On this step, the problem occurs. The system simply can’t drain dirty water. The control board issues the SE error code. This error appears when the device can’t drain water. the water is not drained due to the drain pump malfunction. Note! In order to avoid unpleasant clogs inside the device, be sure to do the next things. Before washing, check the pockets of the clothes that you put in the drum. Don’t forget to pull out coins, keys and so on. Some Samsung washing machine models show nd or 5E code instead of the SE error. Attention, these codes mean the same error. But don’t confuse it with the E5 code. It indicates the heating element malfunction of the washer. If the device suddenly hangs up during washing and issues the SE code, the first thing to check is the garbage filter. You can find it in the lower right corner of the machine body. Clean the part. If the SE error continues to appear in the washing machine, continue searching for a cause. Next, you need to check the drain hose because a blockage may form inside it. Pull out all laundry from the drum, then remove the drain hose from the siphon or from the sewer pipe. Then, drop its end into the tub or sink. This way, you will easily see the outgoing water. After that start the washing program and just observe the process. If the pump tries to press water through the hose, but it barely runs, it signals about hose clogging. Samsung washers work quietly. But if you listen to its work during water draining, you can distinguish the specific sound. The operating drain pump makes a sound. So, if water doesn’t run from the hose after the washing finish, and you don’t hear the specific sound of the drain pump, most likely the problem is in it! If the dirty filter is the cause of the SE error code in Samsung washers, then this problem is the easiest one to solve. How to clean the filter? In the lower right corner of the device’s body, find the plastic cover protecting filter and emergency drain hose. Open it. Take the container for draining dirty water from the drum (the washbowl is the best solution). Remove the plug from the small rubber hose and drain water into the washbowl. Keeping the container, turn the filter screw half a turn counter-clockwise and remove it. Inspect the hole for foreign objects. Pull out everything that has stuck there, including clogs of fluff and hair. Put the screw in place and insert the plug into the emergency drain hose. Next, close the plastic cover. This should solve the problem. If the cause of the SE error is a huge clog in the drain hose, firstly, disconnect it from the washer. Then rinse it with a powerful water jet. Washing the hose with water, simultaneously bend and unbend it. This way, the dirt plug will pop out sooner. Perhaps the clog has formed somewhere deep inside the sewer pipe or in the siphon. In this case, the dirty water will stop drain not only from the machine but also through the sink. You can manually clean the blockage, formed in the siphon. To do this, just unscrew the plug and wash its internal parts. But speaking about the sewer pipe, it requires more efforts. In this case, the very best option is to call a plumber who will quickly clean the pipes. Nevertheless, you can try various liquids for clogging removal. Note! 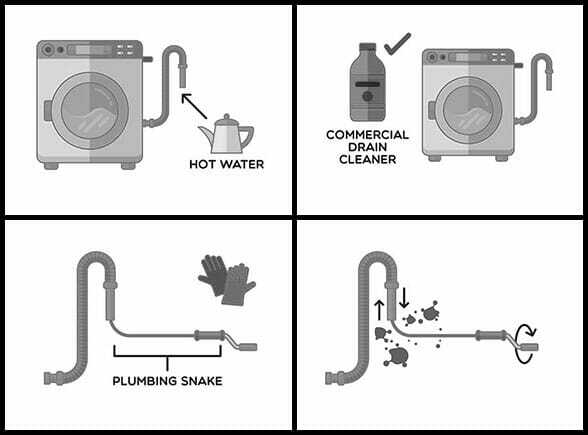 Don’t use aggressive chemicals when it comes to cleaning the drain hose of a washing machine. This can damage the appliance. In the worst case, the SE error code can be caused by a breakdown of the drain pump. To get to this part, you need to remove the back wall. Determining the location of the drain pump is an easy task. Look at the valve to which the drain hose is connected. This valve connects the drain pump. As we have already mentioned, it is better not to repair the drain pump yourself. But in the extreme case, you can replace the drain pump yourself. To summarize, note that the SE fault in Samsung washing machines (or the 5E error code) is not as terrible as it might seem. In most cases, you can find and eliminate its causes on your own.